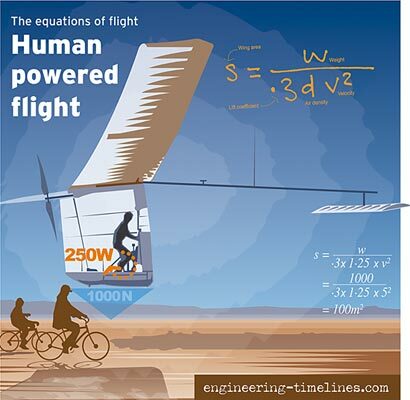 Imagine you have a school project to build a human powered plane. You test your best athlete and discover that he can turn out 250 watts for a sustained period. He weighs 60kg. You decide you can build a plane weighing 40kg with a finesse of 20.
drag 50 newtons (1,000 ÷ 20). your speed will be 250 ÷ 50 or 5m/sec. At 5m/sec, with a weight of 1,000 newtons, how big do your wings need to be?